The French poet René Char called the poet a “magician of insecurity.” In this canto, Dante’s insecure magic is on display. The wild beast Geryon is his most anxious conjuration. The beast is born from his own belt, which he has given to Vergil to cast into the abyss, and thus the beast becomes the figurative assurance, at least he hopes so, that he will not be caught with his poetic pants down. Here, Dante meets the exposure of his art head on, and, in a paradoxical act of disguise, appropriates that exposure for a vessel, rides it as a protective vehicle to new depths of truth-seeking. Of course it is no accident that the first time that Dante refers to his own comedia (XVI: 128) Geryon swims up from the abyss. The beast, “fraud’s foul emblem”, is the manifestation of the poet’s craft, his fraudulent vessel, his ship of lies. The insecurity is palpable in the final lines of Canto 16: Halfway there, don’t abandon me now, Reader. I’ll just point to two more things that I’ve thought about as I’ve mulled over this canto past its due date. First, the landscape, or noticeable absence of definite landscape—we are presented, with the exception of the usurers (who are, however, unrecognizable), with a predominantly sonic atmosphere, the thunderous rush of the falling waters of Phlegethon. And then, in canto 16, we have “the murky air.” It’s worth considering that Geryon, the personification of the poetic enterprise, emerges from an abstract abyss, from “sound and fury” or, as Pinsky has translated, “sheer air” which resonates with Elijah’s theophany of God in the sheer silence. One can’t miss the psychic parallel, the connections with the poet’s unconscious. The poet is a like the diver who releases an anchor from deep shoals and shoots back up to the surface. Second, I think of Virgil’s work in this canto. It is significant that he’s the one who parleys with Geryon while Dante observes the usurers. Virgil has already won for himself lunga grazia, has already penned his epics to lasting favor. 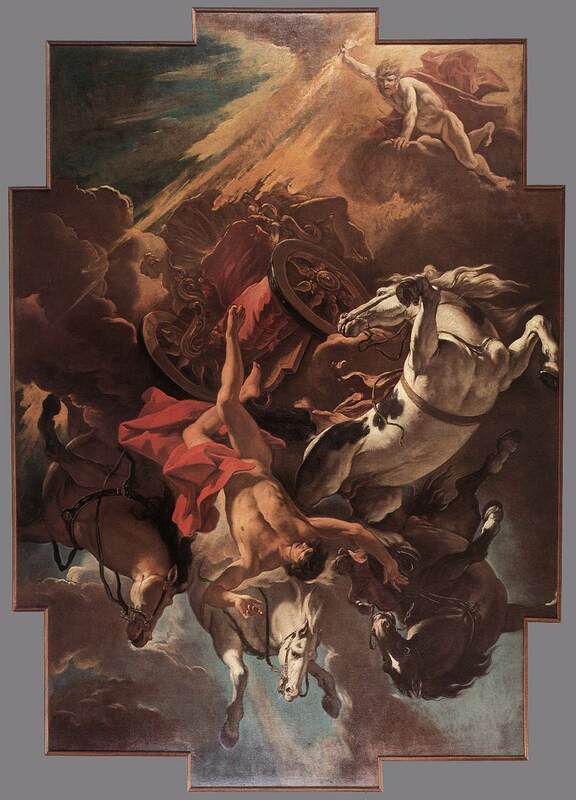 He is Helios, the one secure in his ability to take the reins. 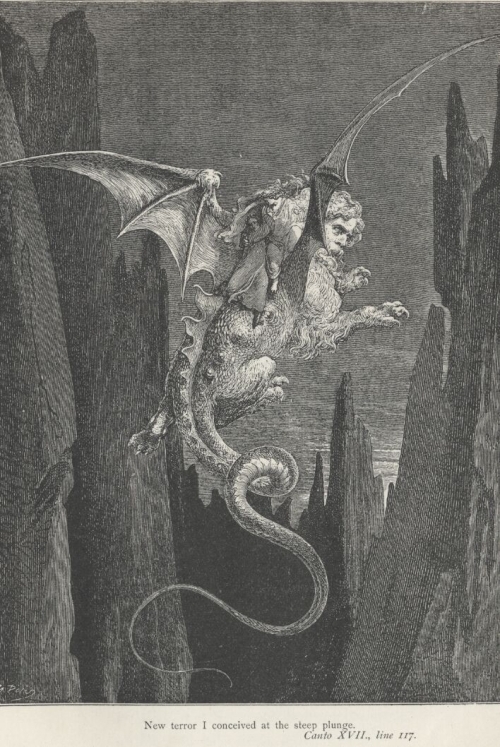 Furthermore, he is a safeguard, and perhaps here we have Dante, by placing Virgil where he does on the back of Geryon, representing his own self-consciousness of including the character of Virgil in his commedia: he is a buffer between the poet and the scorpion tail of the fraudulent art. Midway through our journey, we find ourselves stuck. Dante and Virgil need to figure out how to get to the “next level” (in this case, down to it). I’m crafting a brief reflection to mark the halfway point in the poem–this most eerie episode when Dante must ride the monster of fraud, even as our Jake Willard-Crist rides the steel beast back from Chicago (and will post his offering – the official post for this day – after he’s settled back in). This episode in the poem has always been most fascinating for me. In Gil Bailie’s lectures on Inferno – listened to about nine years ago, and they have always been a huge influence on me – he points out that this midway meeting with Geryon, the monster of fraud, has to do with the poetic enterprise itself. Is this Dante wrestling with his art, the “vehicle” through which he has attained fame, but the vehicle through which he is aiming at truth itself? Virgil “rousing” that beast that makes the next step possible takes some prodding, some negotiating. What Dante is doing, we must remember, is theology-in-poetry, that which aims at the highest truth. Can one ride the monster of fraud (which has an honest man’s face) toward the the angelic realm? Can lies lead to truth? Can fiction bring true knowledge? And perhaps more to the whole artistic enterprise: how do you muster the strength to go on when you realize that the enterprise itself (Dante’s fiction) is itself a fraud? I have attempted in my life five novels. It’s at this point (half way) where I always seem to run out of steam. Is that where Dante is as well, in his writing enterprise? Realizing the fraud of the whole thing? Some other force – in this case, a beast with a poison tail – needs to give you a lift. So to speak. Jake – look forward to what you have to say.